60% of Dutch Muslim women aged 15-35 (around 80,000 women) wear a headscarf. Not due to oppression, but as part of their identity. 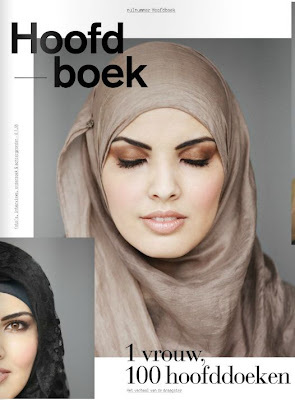 This according to a national survey conducted for 'Hoofdboek', a large-scale project to give Dutch a peek into the world of women who wear a headscarf. The project consists of a book, survey, traveling exhibition and a social media platform on headscarves. According to the survey, the headscarf is increasingly a fashion item, and is adapted to the outfit. 41% said that the headscarf increasingly reflects the identity of the wearer, but 88% of the headscarf-wearers say that you can also look attractive with it. Close to 75% of those not wearing a headscarf said they might do so in the future. While the Dutch think Muslim girls start wearing a headscarf at 13, the average age is actually 19, which means it's a conscious and personal choice. The average Muslim woman has a wardrobe of 34 headscarves. Women with 100 are not an exception. In Hoofdboek, Moroccan-Dutch Boutaïna Azzabi shows off her 100 headscarves. Every one hide a story, anecdote or memory. Half of the headscarf wearers exchange their headscarf daily. 42% choose it based on their mood. On special days in particular Muslim women like to wear their headscarves in a different style, for example during weddings and holidays (66%), but also during Queen's Day (27%) and Ramadan (17%). The headscarf-wearers see the headscarf as an important, but mostly personal, accessory. 46% still have their first headscarf, 49% have never thrown one out. There's also brisk bartering going on with mothers (27%), sisters (33%) and friends (16%). In more than half the families, not all women wear a headscarf. The headscarves are getting increasingly fashionable. 75% of the headscarf wearers have been wearing more colored or multicolored headscarves in recent years - in the trend of color-blocking - precisely adjusted to their outfit. However, the headscarf is not primarily a fashion statement. 66% say it's an expression of their faith, 41% say it's part of their identity. 32% see it as a fashion item and 26% as part their accessories. Headscarf-wearers allow themselves far more fashion freedom than other people think: 68% say it's OK to wear skinny jeans, 75% for high heels and 79% for pretty makeup. 58% buy their headscarves - often simply pretty scarves - in Turkish or Moroccan shops, 58% in the market. Some buy in department stores: 25% in H&M and 15% in V&D. There are no differences between Dutch and non-Dutch when it comes to favorite clothing brands - the headscarf wearers are just as informed about fashion. 65% of headscarf wearers say the current options in stores is too limited. They'd like to see Gucci, Guess, Chanel and Viktor & Rolf design headscarves. The most respected headscarf-wearers are their own mother and in particular the ‘meiden van Halal’ (Girls of Halal) group. Respondents said their like to see Princess Maxima (mentioned most), Queen Beatrix or Yolanthe Sneijder-Cabau wear a headscarf once. The National Headscarf Survey was carried out by Motivaction. Muslims with and without a headscarf as well as Dutch women aged 15-35 were interviewed online and face to face. Some questions were also posed to the general Dutch population 18-70 years all. 1570 people participated.